31st seeds Uzbekistan defeated women’s gold medal favourites Russia as the 2018 Batumi Olympiad got serious in Round 2. 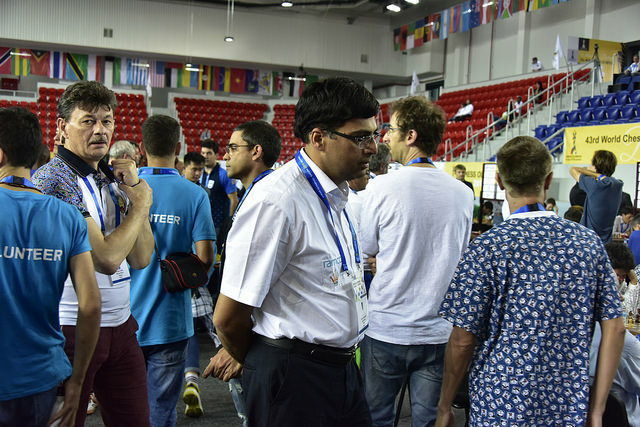 Some big names were back, with none bigger than Vishy Anand, whose first Olympiad game since Turin in 2006 was a silkily smooth win over Markus Ragger. Boris Gelfand and Levon Aronian also showed their class, while David Navara and Peter Leko fell to defeats. 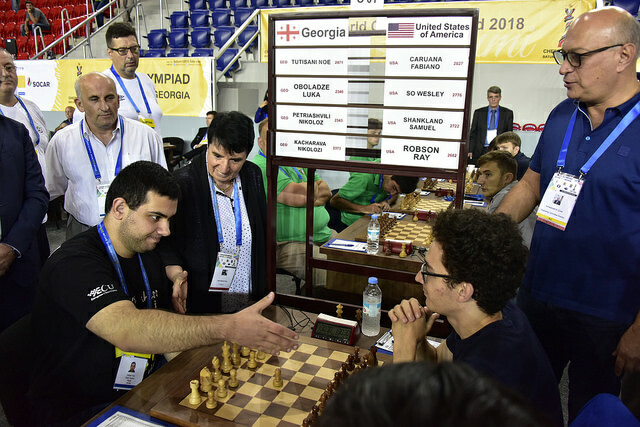 The defending champions USA made it two wins in two as Fabiano Caruana joined the party, but their 2.5:1.5 win over the Georgian 3rd team was anything but convincing. There was nothing lucky about the win for the underdogs, though. Russia were neutralised in dry draws on the top two boards, while on bottom board Natalia Pogonina’s attempt to play for activity in a slightly worse position only left her two pawns down for no compensation. Nodira Nadirjanova showed no mercy. Irina Gevorgyan gave perpetual check from e8 and h5, but she could have made the scoreline more painful for Russia by playing 46.e6! Rf3 47.Qh7+! Kf8 48.Qe4! with the double threat of capturing the f3-rook and giving a fatal check on a8. There would be little choice but to resign. 2nd seeds Ukraine took advantage with a nice win for Natalia Zhukova while her teammates drew, but that match against 54th seeds Turkmenistan was also extraordinary, given Ukraine were at one point lost on all three of the remaining boards! For instance, former Women’s World Champion Anna Ushenina has just played 50.Kg1? Bahar Hallaeva could have played 50…R8a3! and politely enquired what her opponent was intending to do about the threats of 51…Rg3 or in some cases Rxh3. Instead 50…Rxg2+? was an unnecessary sacrifice that allowed Ushenina to escape. 62.Kb3! (or even 62.Kd2) and White can easily deal with the black pawns and will go on to win. Instead 62.Kb1?? allowed 62…Rc1+ 63.Ka2 Ra1+ 64.Kb3 Rd1!, pinning and winning. The only Top 10 seeds with an 8/8 record so far are India, who cruised to victory over Venezuela. With Humpy Koneru and Harika Dronavalli on the top boards they’ll be targeting only a podium finish. 5-time World Champion Vishy Anand has been absent from the World Chess Olympiad since Turin, Italy in 2006, when he was unhappy with the presence on the Indian team of a suspected cheater. Since then, however, chess has skyrocketed in India, largely based on Vishy’s trailblazing career. It’s fitting that he’s now returning to bolster a team that already managed to finish 3rd and 4th at the last two Olympiads. In the end Vishy cruised to victory as India won 3.5:0.5. By this stage Boris had such total control against his Costa Rican opponent Sergio Duran Vega that he could – as Michael Stean once wrote of a Botvinnik game in his Simple Chess, “inscribe his initials on the board with his King if he wanted”. Instead Israel’s no. 1 improved his position further with 41.Ke2 Re7 42.Kd3 Kf8 43.Rc6 and Black resigned. 30.b4! was the key move to give him winning chances, with the pawn becoming a c-pawn and eventually proving unstoppable. That was to prove a critical win, since Armenia scored a narrow 2.5:1.5 victory over Kazakhstan only after Robert Hovhannisyan survived a lost position against Petr Kostenko. Another star making his first appearance was Maxime Vachier-Lagrave, who helped France join Poland and the Netherlands as the only top teams on a perfect 8/8 points so far. This is the position after the unplayed 17…Ng6!? 18.0-0-0 Qe7 19.Ba5, when it turns out Black can enter the craziness of 19…Kd7!! 20.Rxd6+! Kxd6 21.Bb4+ Kd7 and live to tell the tale, since when the dust settles the queen finally gets trapped on g7! We already flagged up Armenia-Kazakhstan, and after the walkovers of Round 1 there were plenty of real battles to cover in Round 2 of the Olympiad. Ukraine at one point seemed set to beat Uzbekistan with ease, but after a draw in Kasimdzhanov-Eljanov the youngsters Abdusattorov and Yakubboev fought back brilliantly to escape against Kryvoruchko and Ponomariov. It was only the luxury of having a player like Anton Korobov on bottom board that allowed Ukraine to emerge with a 2.5:1.5 win. The strong Hungarian side was expected to beat Albania easily, but had to settle for a 2:2 draw after Peter Leko managed to go from a +5 advantage on move 48 to a position where he was getting mated three moves later. David Navara (2740) was the highest rated player to lose, falling to strong Tajikistan Grandmaster Farrukh Amonatov, but that had no consequences for the Czech Republic, who still ran out 3:1 winners. 25.Nd4! leaves Black unable to make a move, with Nxe7# an “unpleasant” threat if the c6-knight moves. So Norway had drawn with the Georgian 1st team in what was expected to be a tough clash, but in the “top” match of the day it seemed as though the Georgian 3rd team would be lambs to the slaughter against the might of the USA… Instead, things went as no-one could have expected! Fabiano Caruana and Sam Shankland have been perhaps the players of the year so far, but they found themselves in uncomfortable positions a pawn down where they might have been made to suffer against opponents they didn’t outrate by 400 points. 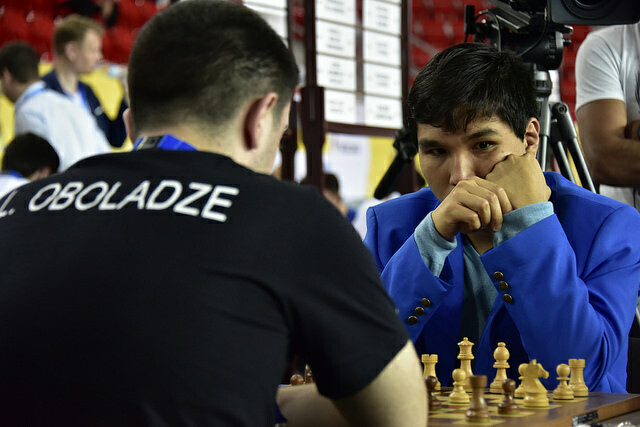 It was left to Wesley So to do the business by smoothly outplaying Luka Oboladze, though you could certainly argue that the scoreline would have looked comfortable if Ray Robson had found one of the numerous wins at his disposal in a queen and pawn ending against Nikolozi Kacharava. Next up for the USA are the high-flying Dutch, who beat Scotland 4:0 to maintain their perfect start to the event. It was aggressive chess, with Anish Giri sacrificing a piece on the kingside and Loek van Wely defying the long-standing advice of his team captain Jan Gustafsson by playing the Najdorf. It looked very convincing at a glance, but Loek had some justification for the nervousness he admitted afterwards, since at one point he allowed his opponent Clement Sreeves a winning blow (22.Nc6!). 47…Rxd3 48.Qh8+ Ke7 49.Re1+ drops the queen, while if the black rook doesn’t move 48.Qh8+ followed by Kxe3 will be a simple way to win. Where can you move the rook, though? Black resigned. ...and though the Irish managed two draws, with Russian-born Alexander Baburin holding Sergey Karjakin with the Alekhine Defence, there was no stopping the inevitable. It’s clear things aren’t going to plan for Black, but would you find the idea 23.a4! Bd7.Ra3! to swing the rook along the empty third rank and clinch victory? In the end White had all his heavy pieces on the h-file when Conor O’Donnell resigned. The final move of the day to mention was a marriage proposal, one of those rare moves that can make both sides happy!